I met S on my first day of school. I remember her cheeky, friendly smile vividly. We agreed there and then that we would be best friends for ever and 34 years later we still are. S by the way has been a horrendous influence on me….she introduced me to horror movies, Jaws and ghosts when I was 8, dragged me out clubbing and on dodgy double dates in our teens and worst of all, taught me how to shave my legs and bite my nails. I remember my step by step lesson in the art of nail nibbling. “Look it’s really easy” she said as she ripped off a bit of nail with her teeth. I was soon hooked. At first I just bit them because S did but as the years went on it became a nervous thing and every time I felt my stress levels increasing, my nail length ended up doing the opposite. I gave up nail biting a good 8 years ago now but having been ravaged year after year, they’re generally weak, bendy and liable to break on a daily basis. In my bid to have strong nails, I’ve done endless research. Gels are great in the short term but the minute they’re removed (never ever rip them off yourself), your nails are weaker than they were to start with. It’s also an expensive habit to get into, costing around £60 a month. Have a Bio Sculpture Gel Manicure which is billed as the gel mani that doesn’t wreck your nails. The gel gives your nails a dose of vitamins and can help them to grow healthily. If removed properly you shouldn’t be left with the usual hangover that you get from a traditional gel manicure. 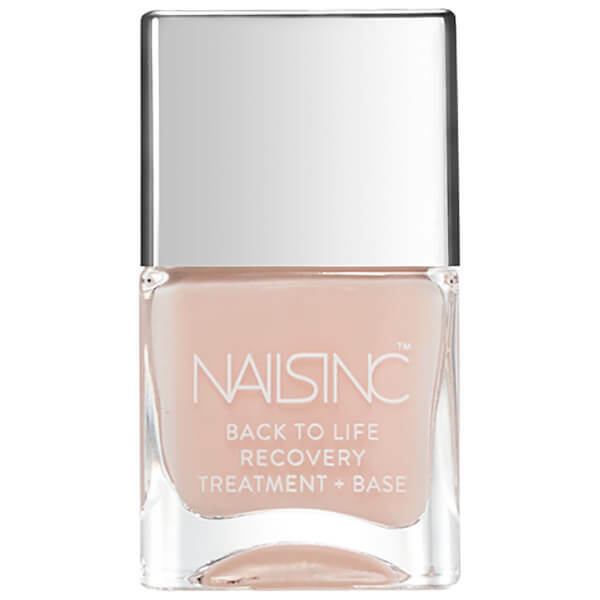 On the day that you get your gels removed get your nails shaped (round is best for minimal breakage) , your cuticles pushed back and ask them to paint them with two layers of Nails Inc Back To Life Recovery Polish. It’s the very best thing for strengthening and sorting your nails and has the added benefit of making them look shiny and healthy…almost as if you’ve had a very subtle French Manicure. Remove and re apply Back To Life twice a week for a fortnight and then go and have another shape and polish. (Far cheaper than a gel mani). Every night apply some cuticle oil (I use this one) and hand cream(This one is beautiful) before you go to sleep and apply hand cream throughout the day. Follow these five rules and you’ll have great nails in no time.